Do you have a noise problem at work? an adviser on occupational noise risks. If your workers use hand-held tools these may also transmit vibration into their hands and arms. By law, as an employer, you must assess and identify measures to eliminate or reduce risks from exposure to noise so that you can protect the hearing of your employees. Where the risks are low, the actions you take may be simple and inexpensive, but where the risks are high, you should manage them using a prioritised noise-control action plan. Review what you are doing if anything changes that may affect the noise exposures where you work. Noise at work can cause hearing loss that can be temporary or permanent. People often experience temporary deafness after leaving a noisy place. Although hearing recovers within a few hours, this should not be ignored. It is a sign that if you continue to be exposed to the noise your hearing could be permanently damaged. Permanent hearing damage can be caused immediately by sudden, extremely loud, explosive noises, eg from guns or cartridge-operated machines. But hearing loss is usually gradual because of prolonged exposure to noise. It may only be when damage caused by noise over the years combines with hearing loss due to ageing that people realise how deaf they have become. This may mean their family complains about the television being too loud, they cannot keep up with conversations in a group, or they have trouble using the telephone. Eventually everything becomes muffled and people find it difficult to catch sounds like 't', 'd' and 's', so they confuse similar words. Hearing loss is not the only problem. People may develop tinnitus (ringing, whistling, buzzing or humming in the ears), a distressing condition which can lead to disturbed sleep. Remember: Young people can be damaged as easily as the old. Is the noise intrusive - like a busy street, a vacuum cleaner or a crowded restaurant - for most of the working day? Do your employees have to raise their voices to carry out a normal conversation when about 2 m apart for at least part of the day? Do your employees use noisy powered tools or machinery for more than half an hour each day? Do you work in a noisy industry, eg construction, demolition or road repair; woodworking; plastics processing; engineering; textile manufacture; general fabrication; forging, pressing or stamping; paper or board making; canning or bottling; foundries? Are there noises due to impacts (such as hammering, drop forging, pneumatic impact tools etc), explosive sources such as cartridge operated tools or detonators, or guns? Noise can also be a safety hazard at work, interfering with communication and making warnings harder to hear. 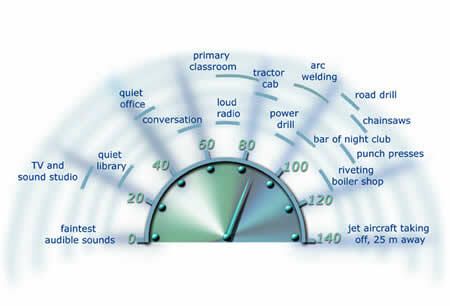 Some examples of typical noise levels are shown in the graphic. Noise is measured in decibels (dB). An 'A-weighting' sometimes written as 'dB(A)', is used to measure average noise levels, and a 'C-weighting' or 'dB(C)', to measure peak, impact or explosive noises. You might just notice a 3 dB change in noise level, because of the way our ears work. Yet every 3 dB doubles the noise, so what might seem like small differences in the numbers can be quite significant. The 2008/09 Labour Force Survey (LFS) shows an estimated 17,000 individuals who worked in the previous 12 months, who believed their hearing problems were the most serious of their work related illnesses. Previous figures show all illnesses caused or made worse by work were recorded which resulted in significantly higher numbers being recorded.